Complementing the recent Quinnipiac University poll that showed Bill de Blasio way ahead in the New York City mayoral race, with 36 percent of likely voters, a new poll conducted by The New York Times and Siena College also has de Blasio on fire..
With 11 days remaining until the primary, the newest survey shows 32 percent of likely Democratic voters supporting Mr. de Blasio, compared with 18 percent for William Thompson Jr. and 17 percent for Christine Quinn. Supreme Court Justice Carolyn Demarest has imposed “a constructive trust for the benefit of the Othmer Endowment Fund” on all of Long Island College Hospital's (LICH’s) real estate currently in control of SUNY Downstate. According to the Brooklyn Eagle, this type of trust is meant to transfer property to "the rightful owner." This could be the first step towards righting a terrible wrong -- the looting of a trust set up by a local wealthy couple to benefit LICH. In her ruling, Justice Demarest reminded SUNY that funds previously “borrowed” in 2000, 2006 and 2011 from the Othmer Endowment Fund at LICH must be restored by SUNY/ LICH. SUNY has previously indicated, figuratively, that it will pay back this money when the SUNY trustees grow wings. Justice Demarest also asked for a full accounting of the money that passed between LICH and SUNY. Kudos to Justice Demarest and also Supreme Court Justice Baynes, for not allowing SUNY to make a mockery of the law in Brooklyn. In another development, Justice Demarest extended the deadline for SUNY to return and fully staff LICH’s emergency department and intensive care unit. More about that here. 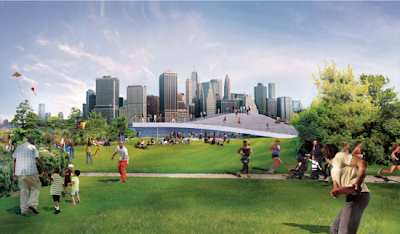 Brooklyn Bridge Park unveiled new Pier 6 parkland design drawings at Monday's Community Board 2 meeting which revealed a vast lawn, a slanted viewing platform, plenty of shade trees and a field of meadow flowers. The plan still requires the approval of the city Public Design Commission. 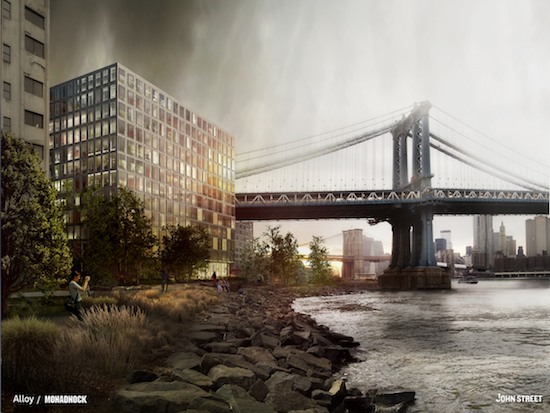 To see more gorgeous renderings, visit the Brooklyn Eagle. 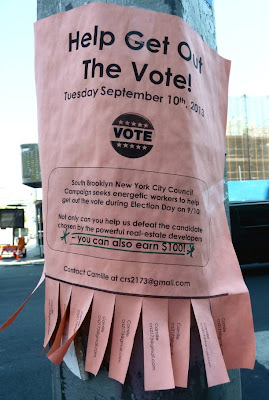 You can help get out the vote and earn $100. This flyer says a "South Brooklyn NYC Council campaign seeks energetic workers" to help get out the vote on election day on September 10. 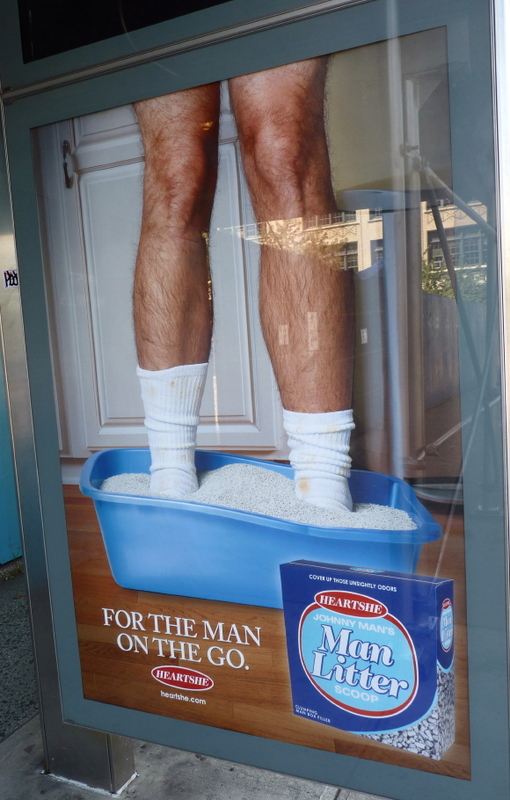 This sign on a bus stop in Downtown Brooklyn is advertising Johnny Man's "Man Litter: For the Man On the Go." The sign shows the bottom half of a barely-dressed man standing in a bin of kitty man litter. A box of the litter reads, "Cover up those unsightly odors" and "Clumping man box filler." The brand is Heartshe (www.heartshe.com). 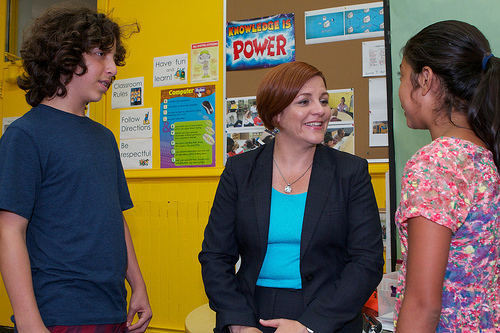 Mayoral candidate Christine Quinn appeared at another campaign event in Brooklyn yesterday, where she endorsed the idea of more math and science schools for middle-school girls. Quinn sounds sincere about her plan for math and science studies for girls -- but candidate Bill de Blasio sends his kids to public schools and has a plan to send all NYC kids who want it to full-day pre-K, which education experts say is the most important thing you can do to lift a child out of poverty. De Blasio also has an ambitious plan for saving NYC hospitals. Quinn tried to jump on this bandwagon when she saw how much Brooklyn voters admired de Blasio's vision, but her plan was pretty much a copy of his, and then we never heard about it again. Anyway, Quinn has already demonstrated with St. Vincents how she feels about hospitals: not her concern (until an intern passes out and she can't get an ambulance). De Blasio not only walks the walk, he marches, negotiates, files lawsuits, gets arrested and serves as a beacon for people to follow. And amazingly, he seems to be helping to slow down the hospital closing juggernaut in Brooklyn. "Mr. de Blasio’s most ambitious plans — like a powerful new state-city partnership to make forever-failing city hospitals financially viable, or to pay for universal prekindergarten and after-school programs through a new tax on the richest New Yorkers — need support in the State Capitol, and look like legislative long shots. Once a Mayor de Blasio saw his boldest ideas smashed on the rocks of Albany, then what?" Yeah, why bother? Quinn may not have much of a vision for the city or plans to improve the lot of the ever-expanding poor or the real middle class (not that $400,000-a-year-middle-class the Times aims at), "but neither has she made a long list of unrealistic promises," the Times says. She may be in the pocket of real estate interests, and may support Ray Kelly's scorched-earth policing policies, but what do we expect in a diminished city? According to the NY Times, the era of getting things done that benefit all New Yorkers is over. Because it's just too hard. A report came through at 7:25 p.m. that a cop was jumped near MetroTech in Downtown Brooklyn at Willoughby and Jay Streets by up to three black males. The suspects stole the cop's walkie-talkie and gun, according to first unconfirmed reports. Description: One suspect is wearing a white hat and white sweater, wearing Air Jordans, carrying iPod. Another suspect is wearing a blue sweater. SUNY Downstate is asking Brooklyn Supreme Court Justice Carolyn Demarest for another week to reopen the Intensive Care Unit, restore full operation of the Emergency Department and restore ambulance service to Long Island College Hospital (LICH) in Cobble Hill. Seems like they have to make sure there are enough doctors on hand. More here. 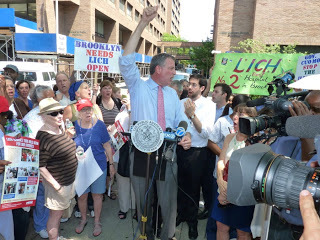 And Interfaith Medical Center in Bed-Stuy, slated to begin shutting down on Monday, has received a reprieve until at least September 11, following a legal action by Public Advocate Bill de Blasio last week in Federal Bankruptcy Court. More here. 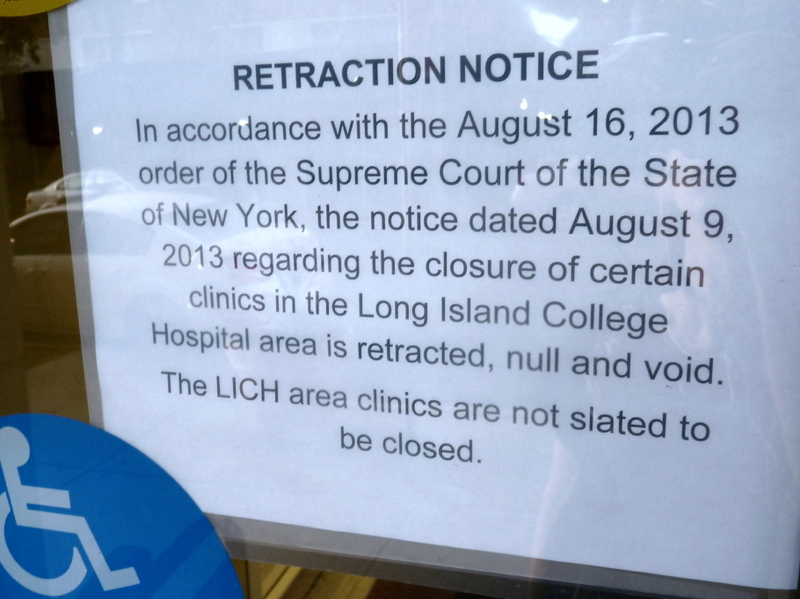 As part of an order issued August 16, Supreme Court Justice Johnny L. Baynes required that SUNY Downstate issue a formal “retraction letter” telling patients that Long Island College Hospital (LICH) LICH clinics are not slated for closure after all. For the first time, Downstate appears to be complying with a court order. We found this sign posted on an ER room entrance on Sunday. Completing the wonderfulness, Supreme Court Justice Carolyn Demarest is ordering SUNY to give back the hospital and all the stuff they stole! Since SUNY did not keep their end of the bargain (which was merely to keep the hospital open) the contract giving it to them is void. Justice Demarest held off the turnover until early September while SUNY and Concerned Physicians of LICH reopen the ICU, Emergency Department and return ambulance services to LICH, according to the Brooklyn Eagle. Thank you doctors, nurses and patients (including those cute stroller protesters), Bill de Blasio and others who put themselves on the line for LICH! Sunday night's Video Music Awards at Barclay's Center was a gritty love poem to the city's hottest borough. Publicity shots and advertising images ranged from Downtown to the Manhattan Bridge bikeway, to DUMBO and the waterfront, to Katy Perry under the Brooklyn Bridge, to Brooklyn icons, skateboarders, subways and sewers. 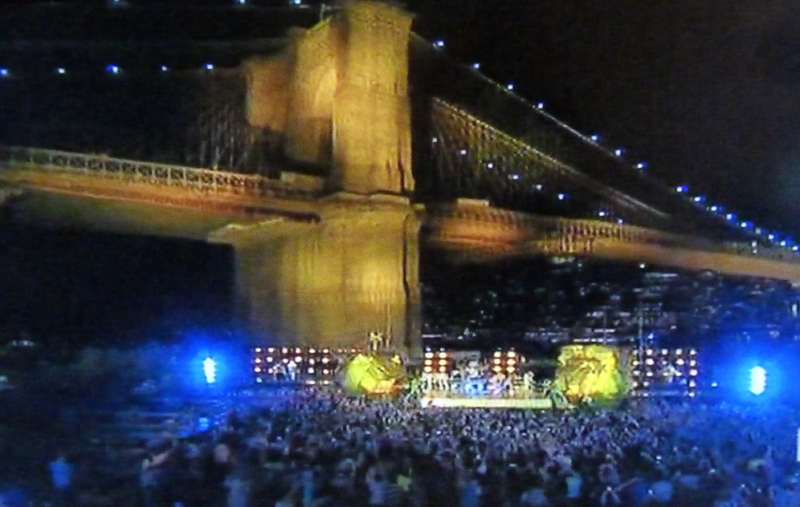 Whatever they were selling (forget Miley Cyrus grinding out the sleaze), Brooklyn was the message. 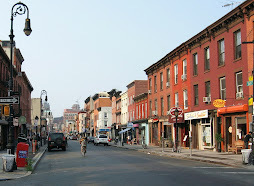 Will Brooklyn's hype overdrive draw hoards of starry-eyed aspirants to Brooklyn the way 60s-era peace lovers and stoners once flocked to Haight-Ashbery? Are you going to Brooklyn? McBrooklyn's going out of town for a couple of days, and may not be near any Internet. 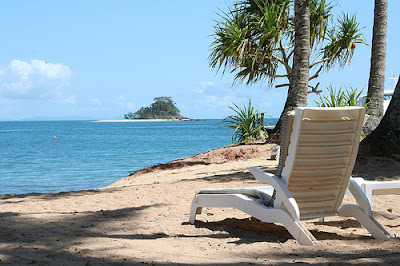 Have a relaxing week everybody -- we'll see you soon. From the scanner: A man was shot at the corner of Sterling Place and Buffalo Avenue in Crown Heights, Brooklyn. The call came in at roughly 4:15 a.m. Wednesday morning. More details if they become available. In an amazing display of sensible justice, Brooklyn Supreme Court Justice Carolyn Demarest rescinded the two-year-old agreement giving SUNY Downstate ownership of Long Island College Hospital (LICH). The beleaguered LICH, robbed blind first by Continuum Health Partners and then by SUNY Downstate, could possibly now go to a new trustee. Continuum has already said it doesn't want LICH back. Justice Demarest said that several suitors have expressed an interest in taking over LICH, and has invited them (and other potential owners) to a meeting on August 22. In her decision, Justice Demarest put to shame the thuggery of SUNY's board of trustees and SUNY Downstate's administrators with their gangs of lawyers and armed guards, all backed by Gov. Andrew Cuomo. 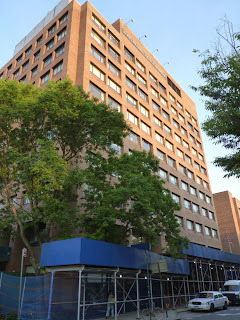 According to the Brooklyn Eagle, which has been following this story on an almost daily basis, after reading about "the demise of Long Island College Hospital (LICH) at the hands of the State University of New York (SUNY Downstate)" Justice Demarest became "increasing concerned as to the propriety of my own order granting approval of the transfer of LICH's assets to SUNY Downstate in light of Downstate's apparent lack of stewardship over those assets in advancement of LICH's charitable purpose." In her decision, Justice Demarest wrote that the original rationale behind the transfer of LICH to SUNY Downstate two years ago "was the representation that LICH would be preserved as a hospital serving the people of Brooklyn." When it became apparent that SUNY had no intention of keeping its end of the bargain -- and was in fact planning to sell off LICH to prop up its own failing hospital -- Justice Demarest determined that she had "a legal and moral responsibility to correct my earlier error." 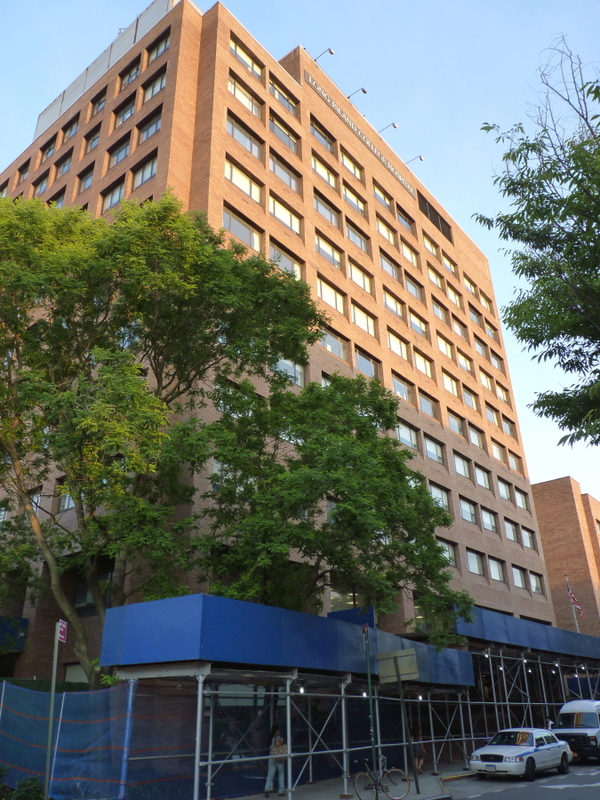 In June, Justice Demarest ordered SUNY Downstate to present a full accounting by August 5 of all LICH property, assets and funds transferred to Downstate. What she saw in that paperwork convinced her to vacate her order of May 13, 2011. From the scanner: A report of a male shot came in 1:15 a.m. Tuesday morning. Another young man was shot and killed at the Albany Houses on June 2. Another young man was shot there on Oct 24, 2012. In 2009, a boy plunged to his death from the roof with a makeshift parachute. A person fell out of a kayak in the East River near Pier 1 at Brooklyn Bridge Park, according to a report on the police scanner at 3:27 p.m. on Sunday. Land and marine emergency services, including the Harbor Unit and scuba divers, are rushing to the scene. UPDATE: The Coast Guard has rescued the victim and is bringing him/her to the Manhattan side for treatment. Supreme Court Justice Johnny Lee Baynes ordered the immediate restoration of hospital services and staffing at Long Island College Hospital (LICH) late Friday. Services must be restored to the levels that were in place on July 19 -- not complete staffing levels, but more than they are now, according to the Brooklyn Eagle. In a 5-page decision, Justice Baynes also appointed an ombudsman as a contact point for staff or patients to notify if SUNY tries to cut services again; told SUNY to return the equipment it took after July 19; and ordered SUNY to get rid of the army of guards it has ringed the hospital with. 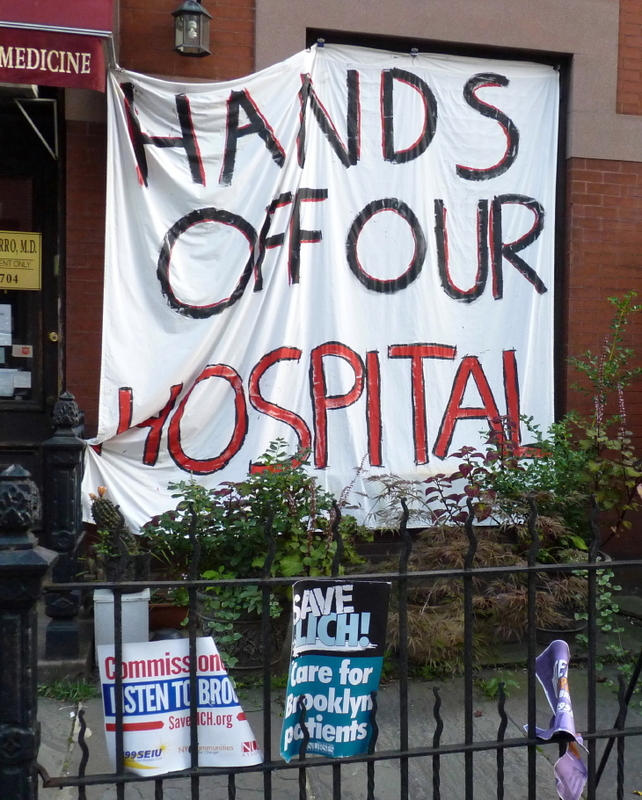 SUNY Downstate has been trying to shut down LICH, in Cobble Hill, in order to sell off its valuable real estate to prop up its own bankrupt hospital in Prospect Heights. LICH supporters celebrated in Cobble Hill last night and another presser will be held at the Nurses Association in Manhattan tomorrow. He's only 15 but he's got a future in broadcast TV. Here is Dante talking up his dad, mayoral hopeful Bill de Blasio. The original NY Daily News headline said: "Fleeing biker dies during Brooklyn chase after police car hits back of ..."
The story read, "A motorcyclist died in a wipeout Wednesday after a cop's car hit the back of his bike during a high-speed chase in Brooklyn, sources said." But sometime before midnight on Thursday the News changed the headline to "Motorcyclist, 33, dies after losing control and slamming into parked car in Brooklyn"
The revised story reads, "Cops said a police car was driving behind two motorcyclists on the same street moments before the accident, but that was not related to the fatal crash." Commenters aren't buying the News' revisions. "This is false!!!!!!!! 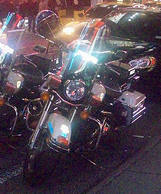 the cop hit the bike from behind and then moved it behind a parked car. they are covering up the real story. there are many witnesses that can testify to that. the people who called 911 was there when the whole thing happen. and yes the other chase was together with this one. they all just separated from each other just to lose the cops. Ya really need to get your facts right before posting false news." "They deleted our comments from the first article also. 20andout and a few other posters messages were removed too." 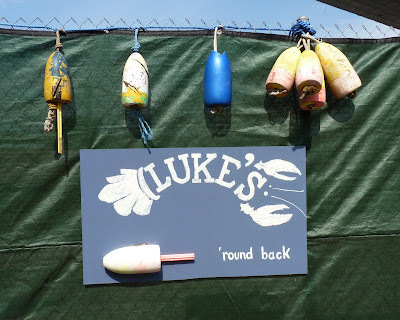 Here's a blog post based on the News' original story. Here's the NY Post's version of the same story. Our take: It's considered a good journalistic practice to date-stamp revisions and explain why they were made. The News provides no explanation of this major change in the story -- and apparently thinks nothing of dumping readers comments wholesale. Which makes their whole story sound manufactured. 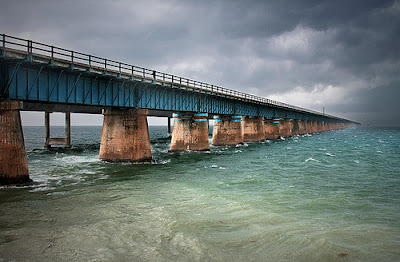 One of the first things that lovable hunk of Republican mayoral hopeful John Catsimatidis is going to do when elected to the city's highest office is borrow up to $25 billion and start building things, like a bridge to Connecticut, according to the NY Daily News. Just think about it. From Manhattan to Connecticut, without all that other stuff in the way. Now there's a man who knows the magical power of money. For months we had to put up with the Manhattan New York Times providing Christine Quinn with endless inches of news print: what she wears, who influenced her life, how she overcame her drinking problem. While the job of City Council Speaker may be considered more newsworthy than Public Advocate, the amount of coverage should have evened out over the past year, when all were running for Mayor. On Tuesday, de Blasio leapt ahead in the polls in the Quinnipiac University survey. Expect the Times to start falling over itself to provide come-from-behind coverage. 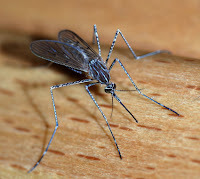 Health officials are suggesting that people cover up and spray themselves with bug repellent, and maybe stay inside between dusk to dawn if possible. Mosquitoes infected with the West Nile virus are making their way across Brooklyn. First detected in Dyker Heights on August 2, it only took one week for them to spread to Broadway Junction, Gravesend, Georgetown, Farragut, Flatbush, Greenwood Heights and Canarsie. 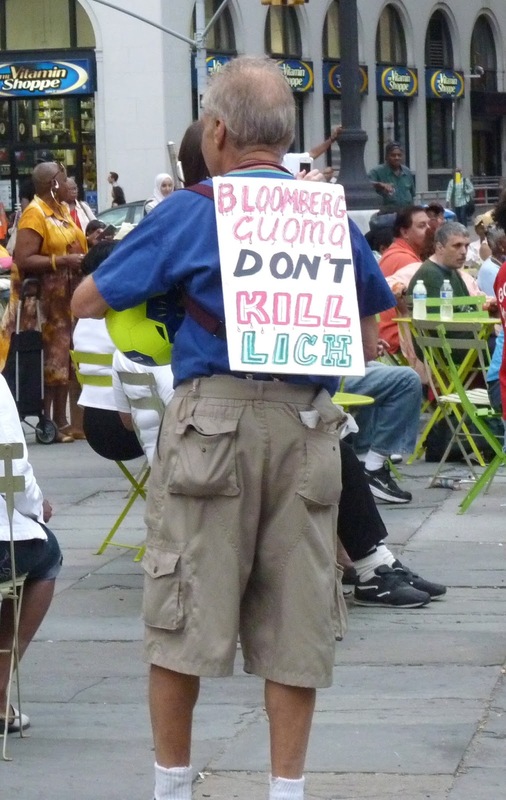 It's gotten to the point where random people attending random events -- like the Night Out Against Crime picnic in Brooklyn Borough Hall, above -- are turning themselves into walking billboards to save endangered Long Island College Hospital (LICH). Is Brooklyn College's New Logo Worth $107,000? The NY Post says that Brooklyn College spent $107,000 on an outside an design firm to redesign its old, "supposedly phallic" logo. Here they both are, the old pictorial logo on the left, the new text logo on the right. College spokeswoman Keisha-Gaye Anderson would not tell the Post where the $107,000 came from, but claimed not from taxpayers or tuition. What happened Wednesday: Debates before Justice Johnny L. Baynes about the role of the state Dept. 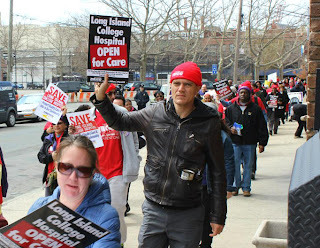 of Health in LICH's closure; who the 90-day notice of hospital closure applys to; questions about an "orderly transition"; and who has standing to sue. Judge Baynes appeals to the parties to settle. Full story about Wednesday's happenings here. 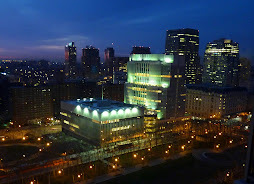 What happened Thursday: Appellate Division dismisses SUNY Downstate’s appeal of temporary restraining orders (TROs) prohibiting the closure of LICH; DOH witness "with personal knowledge" of LICH is a no-show; a DA rep is watching; Justice Baynes again pushes for the parties to reach a settlement. Full story about Thursday's happenings here. 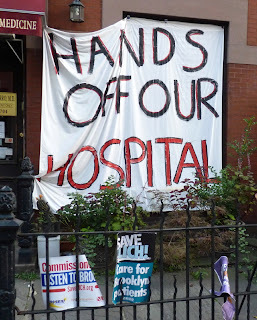 What happened Friday: Two witnesses testify about what is going on inside LICH: One is from DOH, who says she knows absolutely nothing about LICH. The other is a LICH doctor who describes armed guards, locked doors, fired doctors, intimidation, police calls. 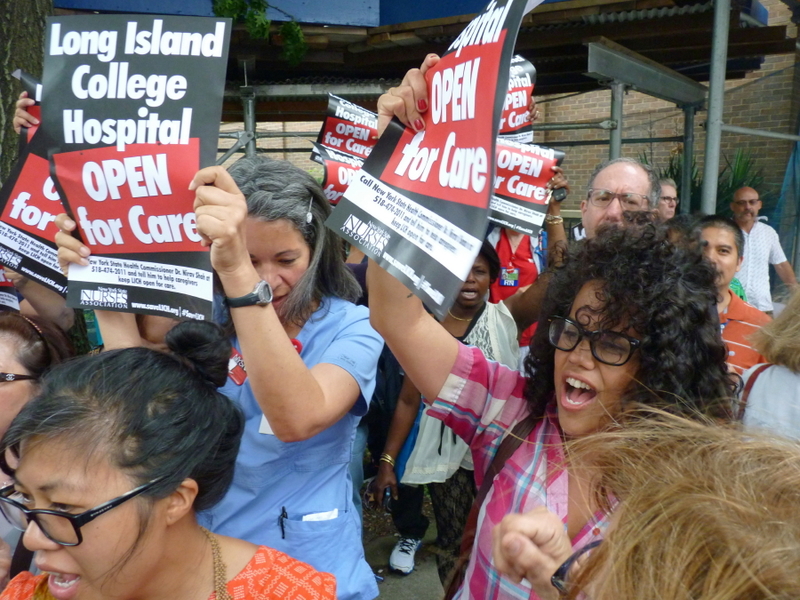 SUNY says no one has right to sue to keep LICH open; LICH supporters hope to enforce a "standstill" while Justice Baynes mulls over the case. Justice Baynes strongly pushes for the parties to reach a settlement. Full story about Friday's happenings here. - Are SUNY's Lawyers Digging Themselves Into a Hole at LICH Hearing in Brooklyn? On Saturday an unofficial website of the Brooklyn Nets ( http://nets.com/ ) was hacked to bring Nets fans to the website of the Boston Celtics instead. According to BleecherReport, one motivation may be the fact that the Brooklyn Nets now feature long-time Boston Celtics icons Paul Pierce and Kevin Garnett. The real Nets website ( http://www.nba.com/nets/ ) will still bring you to the site of the boys in black. The state Department of Health -- which has been reassuring Brooklyn residents that it is watching over the sad goings on at Long Island College Hospital (LICH) in Brooklyn on a "daily basis" since SUNY Downstate began banning ambulances, firing doctors and nurses and bringing armed guards in to intimidate patients and staff -- has just made an amazing about face. On Friday at a trial before Supreme Court Justice Johnny Lee Baynes, the DOH employee testifying as the person having "personal knowledge" of the situation inside LICH, swore under oath that she knew absolutely nothing about conditions inside the hospital. 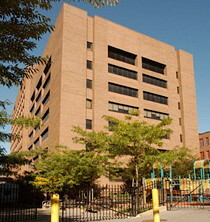 From the Brooklyn Eagle: "In response to Justice Baynes’ questions regarding claims of reduced staffing levels, the dismissal of the ear, nose and throat specialist from the emergency room, calls being made to the police, armed guards on site, the front door being bolted shut or potentially illegal paperwork being presented to patients, Figueroa said she was not aware of these issues." Are SUNY's Lawyers Digging Themselves Into a Hole at LICH Hearing in Brooklyn? Some amazing things are happening at an epic multi-day hearing unfolding at Brooklyn Supreme Court under Justice Johnny Lee Baynes. Yesterday Justice Baynes announced that the Appellate Division had dismissed SUNY Downstate’s appeals of temporary restraining orders (TROs) prohibiting the immediate closure of Long Island College Hospital (LICH). This means that someone at SUNY can now be charged with contempt for violating Justice Bayne's orders to keep LICH operating as a hospital, with full emergency services (including ambulances), adequate staff, etc. Despite the TROs, SUNY has blatantly shut down almost the entire hospital and created a health crisis throughout Brooklyn. Justice Baynes has shown amazing patience with SUNY's repeated violations of his orders but it appears his patience, rightly, is wearing thin. SUNY's shutdown of LICH is costing LICH -- by SUNY's own somewhat dubious reckoning -- more than $11 million a month. Justice Baynes gave the parties another chance Thursday afternoon to reach such a settlement, out of the eyes of the public. But it doesn't seem likely SUNY will deal. Their hubris may catch up with them however, as eye-witnesses testify on Friday about SUNY's violations. If Justice Baynes is convinced that the violations took place (and evidence is in abundance), he would have no choice but to penalize SUNY. In the meantime, someone from the Brooklyn DA's rackets office is sitting in on the hearing, saying nothing but watching everything. 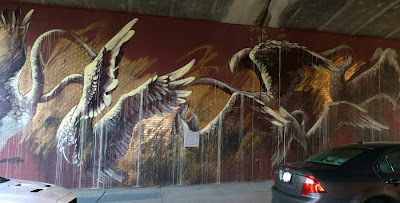 Faith47’s mural, “The Preciousness of The Hunt", on an underpass on Pearl Street in DUMBO, Brooklyn. 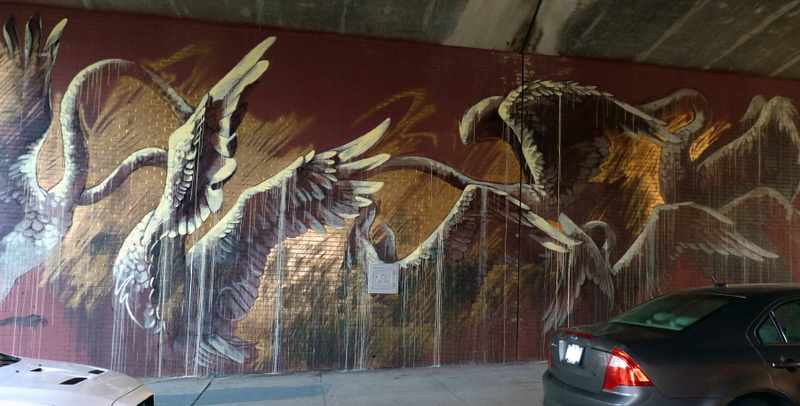 On the other side of the same overpass is this striking mural. Anyone know the artist? According to the Brooklyn Eagle, all those ambulances and police cars next to Cadman Plaza Park in Downtown Brooklyn / Brooklyn Heights on Tuesday at about 11:30 a.m. were responding to an accident involving three kids, one adult, and a taxi. FDNY said three young boys were hit, along with the adult. 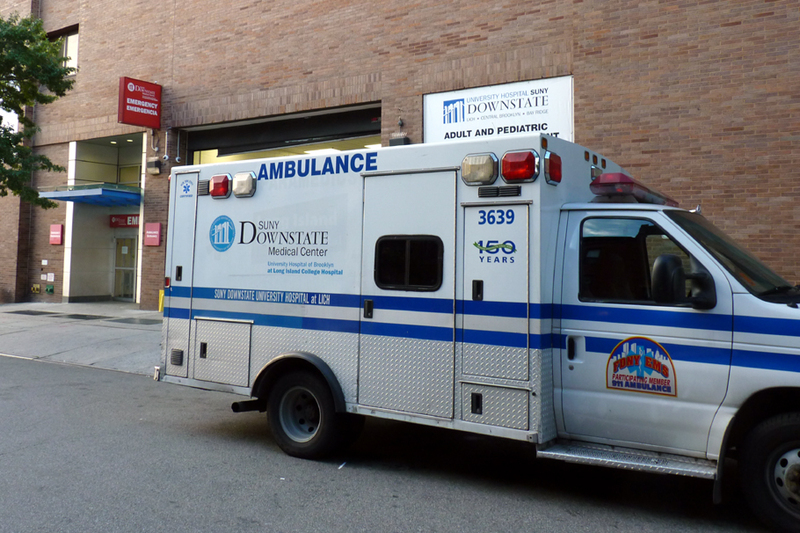 SUNY Downstate is not allowing ambulances to bring patients to nearby Long Island College Hospital (LICH). Because of this other nearby hospitals have wait times of hours in their ERs. So it's no surprise all four victims ended up at New York Presbyterian-Cornell Hospital in Manhattan.That's all the way up at 68th Street. Thank G*d the kids survived. Manhattan hospitals had better brace themselves for a flood of trauma victims as LICH (Cobble Hill) and Interfaith (Bed-Stuy) are on the verge of closing. While we didn't know it at the time we shot this photo, we believe the taxi shown here is the one in question, because police and various people went in and out of it several times. 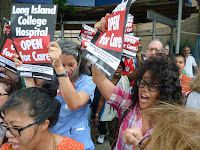 LICH Rally in Brooklyn Monday at 11 a.m.
Join Congresswoman Nydia Velazquez in a protest to save Long Island College Hospital (LICH) Monday at 11 a.m., at 339 Hicks St.
SUNY Downstate has been trying to illegally close the hospital down, despite restraining orders and massive community opposition. 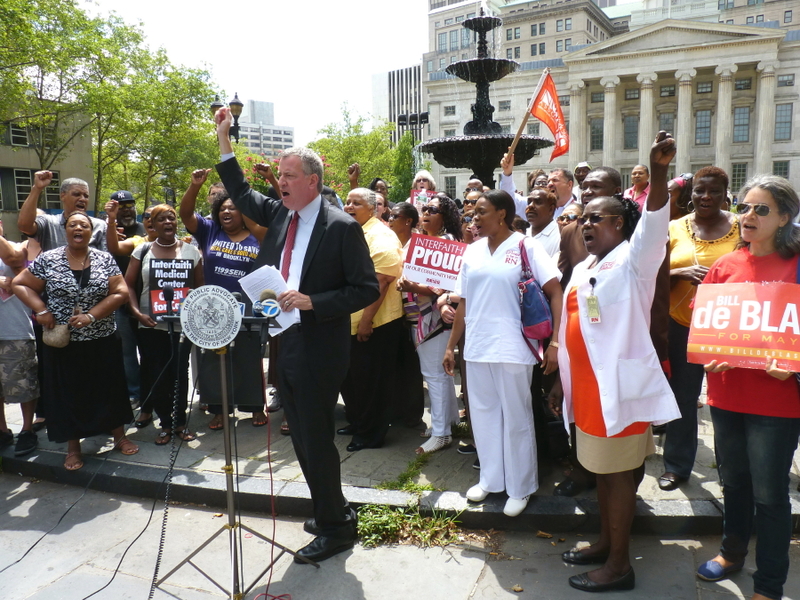 Tuesday at 4 p.m: Join Brooklyn hospital supporters for the Race for Brooklyn Hospitals. Meet at Coffey Park in Red Hook and go by bus and by car to different Brooklyn ERs. Let's see how long it really takes! 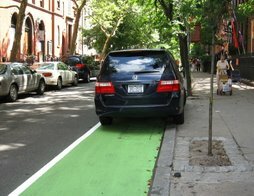 Green flag at 5 p.m.
More posts mentioning LICH here. A poster on the Brooklynian blog writes about the owner of a pitbull mix in Prospect Park who encourages his dog to attack other dogs. The scariest part of the story? He then joins his dog in the fight, kicking the other other dog and stabbing it with an ice pick. He sometimes hits the other dog's owner with a cane or umbrella as well, Whynot_31 reports. At about 2:48 a.m. Monday morning, cops were called to 228 Duffield Street between Willoughby and Fulton, following a request for crowd control. That's the address of the Sheraton Hotel in Downtown Brooklyn. More details if we get them. This rather gloomy rendering illustrates the new planned residential building at John Street in DUMBO's Brooklyn Bridge Park. It was announced yesterday that BBP has chosen Alloy Development and Monadnock Development to design and develop the building, according to the Brooklyn Eagle. The residential building will include 47 apartments and cultural and retail space on the ground floor, which will be occupied by the Brooklyn Children’s Museum. 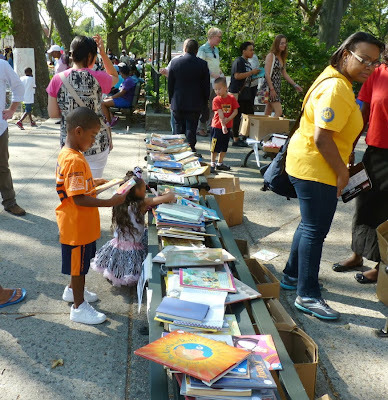 BP Marty Markowitz said, "DUMBO’s Johns Street will be on par with Sesame Street for the borough’s toddler and preteen set once the renowned Brooklyn Children's Museum opens its doors on the waterfront." The Museum annex will occupy 1,750 square feet. According to NY1, the vote to move forward with the plan was not unanimous, with elected officials who sit on the board coming out against it. They sided with the construction trades, who showed up at the meeting demanding union labor be used. Note to potential buyers and park-goers: Residents of DUMBO and other neighborhoods in Western Brooklyn no longer have access to a hospital or emergency medical care. NYPD cannot carry out warrant checks on people they are stopping on the streets. As dispatchers have explained over and over to police officers trying to call in names that they read from the IDs of people they have stopped, "The entire New York State warrant check system is down!" No word on what officers are doing with those people who can't be checked for priors. This same problem with the statewide system occurred several weeks ago as well. With all the stink about Anthony Weiner's private indiscretions, the little details -- like where he stands on the issues -- have been kind of lost. 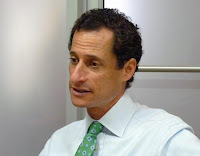 As of yesterday, Weiner was still intent on running for Mayor of New York City. That being the case, the Brooklyn Eagle interviewed him, and oddly enough, the interview focused on political issues. 1. He wants to experiment with a city-administered single-payer health insurance plan. 2. He thinks the city never should have closed all those hospitals. 3. 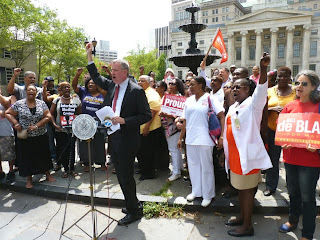 You know Bill de Blasio’s plan to save healthcare by forming a Brooklyn Hospital Authority? Weiner says he thought of that first. 4.. 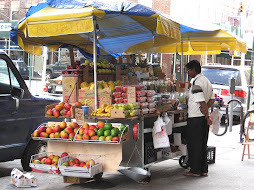 He's OK with selling air rights over libraries and senior centers to developers. 5. He's OK with Atlantic Yards, but thinks the affordable housing and public benefits should have come first, before the arena. 6. Brooklyn's Tech Triangle is all well and good, but we really need middle class jobs. 7. He looks forward to "an open and confrontational relationship" with the City Council. 9. His administration will be more fun than Mayor Bloomberg's. 10. People are following him. Read the full interview at the Eagle.